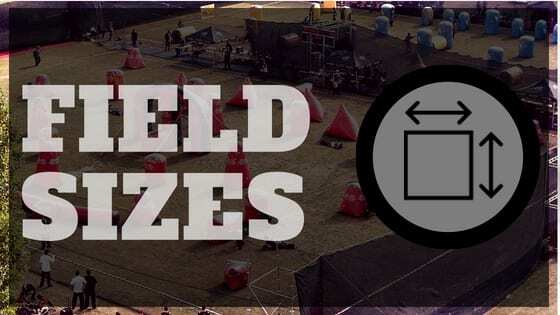 On the speedball side of paintball there are typicaly 3 sizes of paintball fields you can find. Each size is specifically made for a certain amount of people. Of course you could always squeeze a couple more players than recommended, but for maximum fun and safety, you should probably stick to what is advisedThere used to be 4 standard paintball field sizes, but now that the era of 10 man paintball teams has diminished due to the impractical costs of operating a large team, we now have just 3. Keep in mind, these fields are popular because they are the standard sizes for divisions in major tournaments. The smallest of all paintball field sizes. 3 man paintball fields can be used for 1v1 matches, 2v2 matches, and 3v3 matches. This is my favorite size as the games are quick and very rarely predictable. In 3v3 matches, even if you are the last player on your team you still have a chance to win, its happened many times before, and it will continue to happen as long as determined paintballers continue to play paintball. 3 man paintball fields can be found for cheap on eBay. If you plan to buy one brand new, expect to pay at least $1500. How many bunkers are on a standard 3 man paintball field? 15 paintball bunkers. 5 man paintball fields for a long time lived in the shadow of the once popular 10 man paintball field format. Now that 10 man play rarely exists 5 man play has exploded. On a 5 man paintball field you can find 23 paintball bunkers, a little more or a little less, 23 however is the norm. Features such as the snake are more predominate on 5 man fields than a 3 man field. The retail price of a brand new 5 man field is around $2500. The largest standard paintball field around right now. 7 man fields have a whopping 29 bunkers and retail for around $3500. The snake is longer and there are more variations of bunkers on the field. If you are looking for a longer game with much more shooting then this is the field you should be playing on. There is definitely much more room for “disappearing” as it is hard to keep track of every player on the field. Attribution: The field picture used in the header image on this post is by Peter Kadlec.